We are major Manufacturers, importer and exporters of the Ladies Stylish Kurtis. These Kurtis manufactured using high grade and fine quality fabric, the range is tested on various quality parameters.The range of products are Designer Kurti, Ladies Intricate Kurti, Designer Neck Kurti and Ladies Exclusive Designer Party Wear Suits. Ladies Stylish party wear Long Designer Suit to our valuable customers. Designed in compliance with the prevailing fashion trends, these dresses are known for their trendy design and fine finish. It has full sleeves with a wide neck, white floral patterns extending from the neckline to the chest and along the sides. Perfect for an everyday wear, team this cotton kurta with white leggings, simple jewellery and sandals for that fashionable look. Pakistani Suits are very famous and highly preferable clothing wear World wide. Pakistani embroidered Designer Suits are best fashion wear with outstanding quality as well as the fabric has enormous edge over others. New Ladies Suits Design 2015 Trends in Pakistan. They face so much difficulty in choosing their outfits. With the passage of time the designs of dresses are changed. Every year you find lots of variation in seasonal wears. As the dresses of winter are totally change from that of summer. 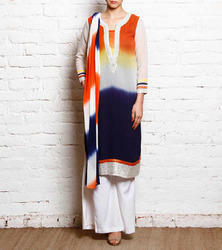 Stylish kurta design for modern girls contain a huge series of top Pakistani clothing brands.